Home of the double entendre, the Hooters chain has become an American icon over the course of its short life. Founded in Florida during the glorious 1980s, the company with a hooting owl for a logo boasts its own magazine, a hotel on the Las Vegas Strip, and famous alumni like Hugh Hefner's former girlfriend Holly Madison. 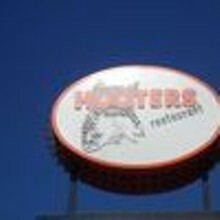 The Hooters girls at each of the 450 locations are the heart and soul (or is it the "T and A"?) of the company; from the American Midwest to the Czech Republic to Tokyo, every girl sports the same bright orange short-shorts, flesh-colored pantyhose and white sneakers. Perhaps it could be the food that keeps loyal St. Louis customers coming back. The menu focuses on chicken wings, with sauces ranging from mild to atomic, but there are also seasoned curly fries, shrimp, oysters, crab legs, burgers, and sandwiches, along with plenty of televisions tuned to whatever's going on in the sports world. Check out your local Hooters on Voice Places.